At His Majesty's Chapel, Whitehall, the usual annual Royal donations were distributed to as many poor men and women as the King is years old, viz.64 of each. A temporary building had been constructed at the back of Whitehall Chapel for the occasion, which was divided into two compartments, the larger for the reception of the maundy men and women. At the ends, seats were prepared for the accommodation of the visitors, who were admitted by tickets; the smaller room was fitted up with shelves, a store larder, on which were arranged the salt fish, loaves of bread, etc., to be distributed. About eleven o'clock the maundy people arrived, and were arranged by the attendants, the men at one table, the women at the other. The maundy people being seated, Mr Hanby, secretary to the Lord High Almoner, and Mr James, Groom of the Almonry, attended by the Yeomen guards, with an usher, ordered the tables to be covered with damask cloths, and supplied every man and woman with a loaf weighing one pound and a half. The attendants then placed on both tables a number of wooden dishes, on which were pieces of fine beef, weighing three and three quarter pounds a-piece. At twelve o'clock, the Sub-Almoner, the Rev Dr Goodenough, entered the room in his robes, attended by the secretary, and having inspected the tickets of admittance of the maundy people, pronounced the following Grace before meat: "Bless, o Lord, this Royal Maundy to the use of these thy servants, and dispose their hearts to the praise of the Holy name, with gratitude to their Royal Benefactor, through Jesus Christ, our lord .Amen." The Doctor then inspected the quality of the meat, and having seen that all were supplied with a piece of beef, said the grace after meat: "Grant O Lord, in the hearts of these people grateful obedience to the Royal dispenser of these thy blessings, and cause them to look up to thee as the Supreme Author of every good, through Jesus Christ our Lord". The cloths were then removed, and a wooden platter, on which were four loaves, Two salt salmon, two salt cod, eighteen salt herrings and eighteen salt ditto, was placed before each person, which the Sub-Almoner inspected. 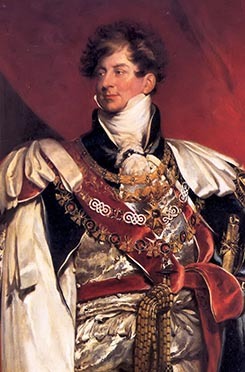 The distributors then produced several leather flagons filled with ale, and a quantity of wooden ale-cups, out of which the Sub-Almoner drank to the health of the King George IV, which was also drank by the recipients, who shortly afterwards departed with their load of provisions. At two o'clock the recipients re-assembled in the interior of the Chapel, to receive the remainder of the Kings maundy. At three o'clock the Yeomen usher, followed by eleven Yeomen in their state dresses, and one bearing a large gold dish, on which were one hundred and twenty eight purses, each purse containing a sovereign, and small silver pennies, as many as the King is years old; Mr House, the King's sergeant of the Vestries; the Sub-Almoner, followed by two girls and two boys from the Westminster National School, selected for their good conduct; the secretary, and the groom of the Almonry, etc. etc., formed in procession all wearing white scarfs, and carrying nosegays. Mr Cooper played a solemn piece, on the procession entering the chapel. 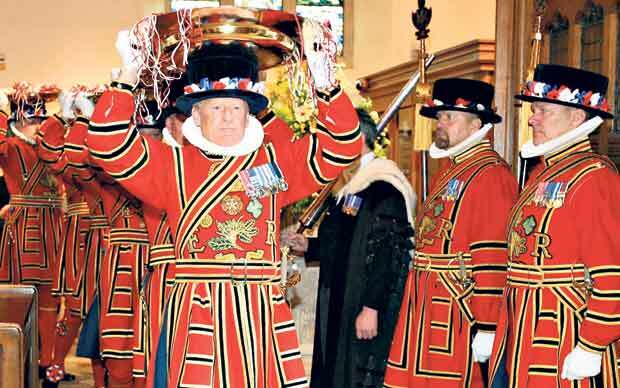 The procession advanced up the aisle; the Sub-Almoner and two Yeomen took their station within the altar, the officers and children on seats in front of the organ, and others along the aisle, and etc. The appropriate Church-service for the day was then read by the Rev Dr Vivien, The Rev Messrs Knapp, Barham and Pack. The gentlemen of the Chapel Royal were Messrs Gore, Goulden, Molyneux, and the young gentlemen of the Chapel Royal. Yeomen of the Guard carring maundy purses for distribution.